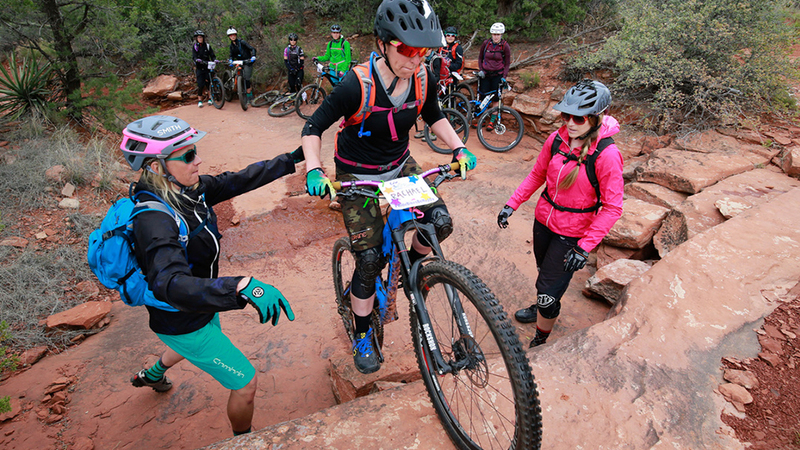 Ladies AllRide is a movement dedicated to growing the community of female mountain bikers across the globe. Professional mountain biker and skills instructor Lindsey Richter traverses North America in a sprinter van inspiring women to face fears, believe in themselves and get RAD on their mountain bikes! Together with her business partner Meredith Brandt (Grit Clinics, LLC ) they run a series of energizing and inspirationalmountain bike skills camps for women: Liv Ladies AllRide: Powered by SRAM. Complete with the best coaches in the business, these events bring women together in a welcoming environment to enhance their lives on and off the bikes. There are ten signature Ladies AllRide events in epic riding locations across the U.S. and one destination camp in Italy 2018. Come play on bikes with us because ladies should All Ride Bikes! Growing the presence of women in mountain bike communities across the globe through fun and educational skills camps. We bring ladies together to improve their mountain biking skills, while we also inspire them to see how mountain biking can enhance their lives. Please join us at one of our ten signature mountain bike camps and take your confidence, riding and lifestyle to the next level! Sign up for our newsletter and get all the fun info about where we are and who we are inspiring around the globe!